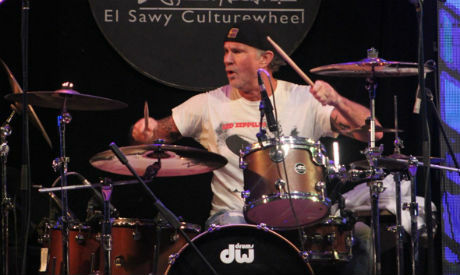 While on tour with Red Hot Chili Peppers, the American drummer Chad Smith gave a special performance on Wednesday at El Sawy Culturewheel in Cairo. 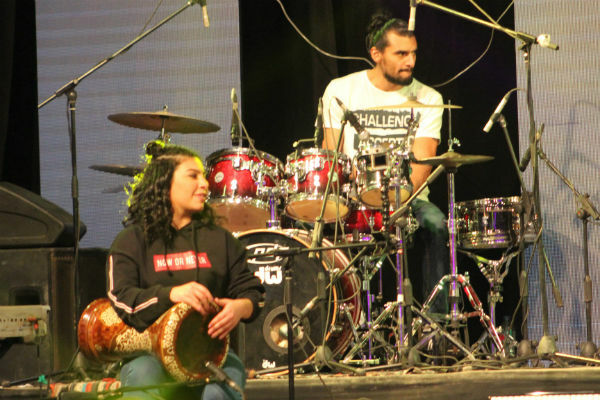 The pillar of the international rock scene shared the stage with well-known Egyptian musicians in a jam collaboration facilitated by TOFTrading - Tarek Ramadan, DrumChannel and Drum Workshop Inc. 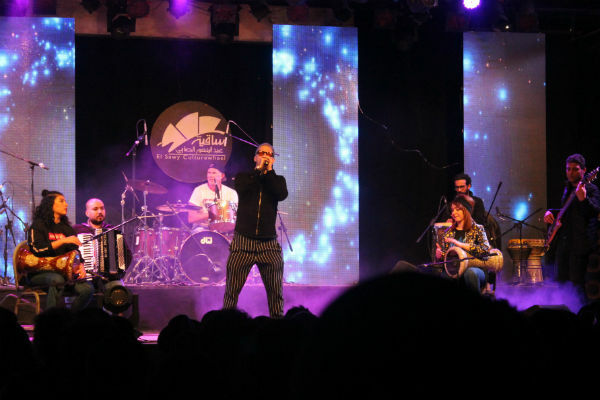 Along with Chad Smith, the event saw Ahmed Hisham on drums, Samer George on bass guitar, Beshoo Shenoda on accordion, Abdelazeem Azema on percussion and Fady Badr on keyboards. The two young female percussionists from Egypt, Donia Sami and Rania Amr, were a unique feature of the show. “I am really excited to feature the girl drummers, because I think it is important to uplift women in this country, and to definitely uplift women percussionists and musicians,” Smith commented during the concert opening. Chad Smith in a performance with the Egyptian musicians, 13 March 2019, El Sawyculturewheel. A solo by Chad Smith opened the programme, then Ahmed Hisham joined on drums. Donia Sami and Rania Amr played a darabouka set, demonstrating the drum that is an integral part of Egyptian music. Gradually a jam session unfolded, with solos and spectacular drum offs, fusing well-known rock motifs with Egyptian rhythms. One of the pieces the musicians shared on stage was “Black in Black” by AC/DC, with Andrew Watt on vocals. This is the first time the Red Hot Chilli Peppers have visited Egypt. The upcoming concert by the pyramids on Friday evening is a big event for fans around the world and the group itself. “We went there yesterday to check out the venue, and it was amazing and mind-blowing. The energy there was incredible. We are really excited to play a concert with such an iconic landmark in the background,” Smith told Ahram Online. According to Smith, the programme might include “a special Egyptian song,” as it is a tradition of the group to play a local tune wherever they go for a performance.